Take a look at this video on Delphi Starter edition if you're looking for an inexpensive alternative to the Professional, Enterprise and Architect editions to build apps for your personal use and some commercial use. See the Delphi Starter web page and FAQ for more information, features, and licensing details. As we know, this version have only Interbase and do not have the DBExpress for database acces. If you are a student and want to build an aplication with a database, you'll need to buy Interbase. The low cost becomes no more low cost, becouse you have the Interbase cost. I think that to leran Delphi withoud DBExpress is not something good. Delphi Starter includes a free InterBase Developer license and software do you don't have to pay for an InterBase license when you're developing and testing your apps. You would just pay for an InterBase license when you want to set up a production InterBase server or embed InterBase in apps you will be distributing. Students and schools can get Delphi Professional or Enterprise with dbExpress at an academic discount. With the academic discount, the price generally is less than Starter. Wow! Really great. 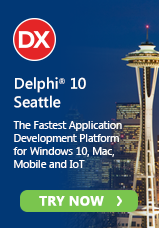 But guys please make delphi crossplatform (we need linux, mac, ios...). Lazarus already has it, but I love Delphi since it was started. When did they take out the interbase developer? I have XE6 starter and it is not there.